Wow, those fonts are so clear! There was a bug with a recent version of Cairo and Openoffice who caused this problem and required patching Openoffice. 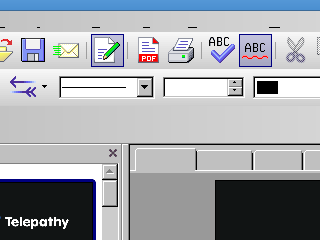 It is fixed in Openoffice 3, at least in the version in Mandriva 2009.0. Hi Robert, I saw this in combination with Compiz. You can try to disable it. I believe that this problem occurs when one compiles against a wrong Xft library or something. I’m not sure why the build system can’t prevent this from happening. I have sort of the same problem in open office on ubuntu, the font shows, but when I move the cursor over for example the top menu or the right-click menu elements it disappears at times, pretty annoying. I am using the standard version of GTK, etc. I recall a similar problem with bad fonts on the oo.o UI in ubuntu. The solution was to edit .fonts.conf to say i wanted to use an specific lcdfilter. I’m using the same versions that you are and everything seems to be working okay for me. Try installing openoffice-gnome? It has something to do with OO.o trying to use anti-aliased fonts in combination with certain graphics cards. Click the 4th menu from the left. Click the 4th menu point in that menu. A new window should open showing a treeview to the left. Click the 5th line in the treeview from the top. The “view” should now contain some checkboxes. Uncheck the 4 checkboxes to the right. Click the 1st button from the left in the bottom of the window. At least that’s how I had it in Qt apps if I used a certain font. Underscores visible, nothing else as far as those glyphs go. Ahh yess, thank you heaps for this, I’d been mystified for some time why Openoffice was so different (even in behaviour) across my two two Gnome installations of Etch.